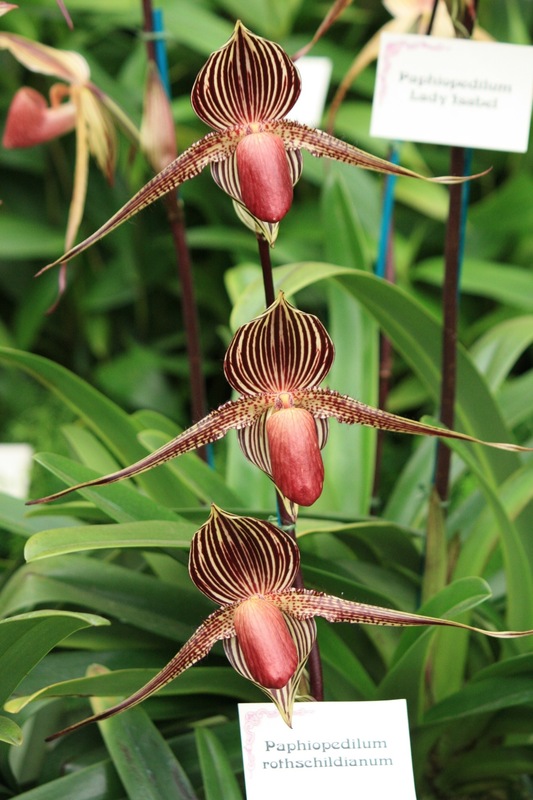 Looking for all the world like neatly groomed Victorian moustaches, these eccentric flowers belong to Paphiopedilum rothschildianum, Rothschild’s slipper orchid. They seem a fitting choice for Father’s Day, with their masculine good looks. Discovered by an Englishman abroad, these exotic blooms are a long way from their home in the rainforests around Mount Kinabalu in northern Borneo. Fabulous flower, but I wouldn’t like to attempt to pronounce it after a large sweet sherry, would you? I like a nice dry Manzanilla personally! It’s otherwise knows as King of the Paphs – a bit easier to pronounce. I don’t suppose I’ll ever grow one – it looks like a lot of hard work. Just off to look that up ……. The sherry or the plant? What fascinating flowers. They look like faceless birds. Thanks for sharing the photo.